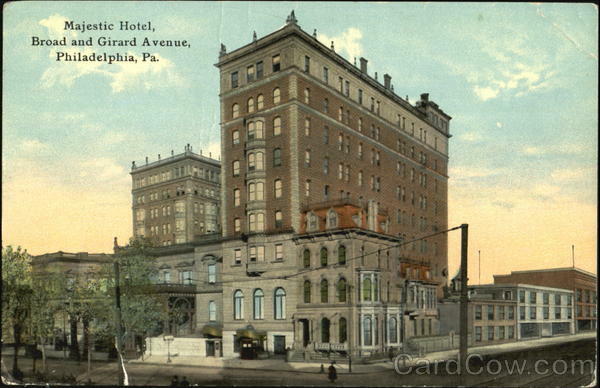 (October 17th, 1911) PHILADELPHIA –The two best teams in baseball went head to head again on Sunday afternoon in front of a packed house at Shibe Park, and when it was over, baseball’s titans were tied at one game apiece. The A’s got off to a quick start, leadoff hitter Bris Lord tagging one to right field that right fielder Red Miller mishandled, allowing Lord to get to second. Oldring moved him along to third with a bunt, and then Lord scored on a passed ball. The Giants quickly countered, scoring in the top of the 2nd on a Herzog double followed by a Chief Meyers single off of Athletics starter Eddie Plank (left). The 6th inning is where the drama truly began. In the top of the 6th, Fred Snodgrass lined a ball right down the left field line. The speedy Snodgrass thought he had a sure double. But he seemed to get slowed by the mud around first base, and was gunned down at second. 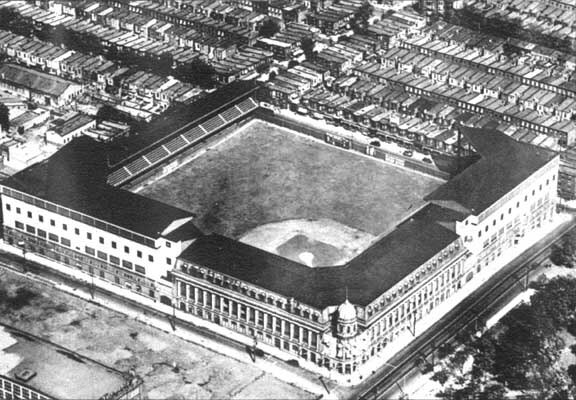 Christy Mathewson, writing in the Times, blamed the out on the Philly grounds crew. The grounds crew was not pleased with Matty’s assesment. The rivalry seems to be heating up a bit. 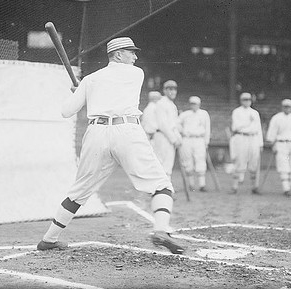 Just a few minutes later, Eddie Collins came up for the A’s with two outs and nobody on. He doubled to almost the same spot that Snodgrass had hit the ball moments earlier, down the left field line. He didn’t have any problems rounding first, and made it cleanly into second base. That brought up Frank Baker. Giants pitcher Rube Marquard spoke after the game about what he was thinking when Baker came to the plate. Baker (right) took that fastball for a ride, sending it over the deep rightfield wall at Shibe (you can see a picture of Shibe here to imagine how far the ball went. Right center is a pretty good ways from home, when you consider that dead center is 505 feet.) The crowd went wild, the people cheering from the rooftops screamed so loudly they would have been heard at City Hall, had there not been thousands more people screaming wildly after watching the homer on a Playograph. 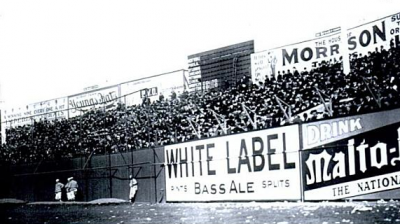 The crowd howled, whistled, cheered, and even banged on the roof of the visitors tin dugout with their canes and feet. 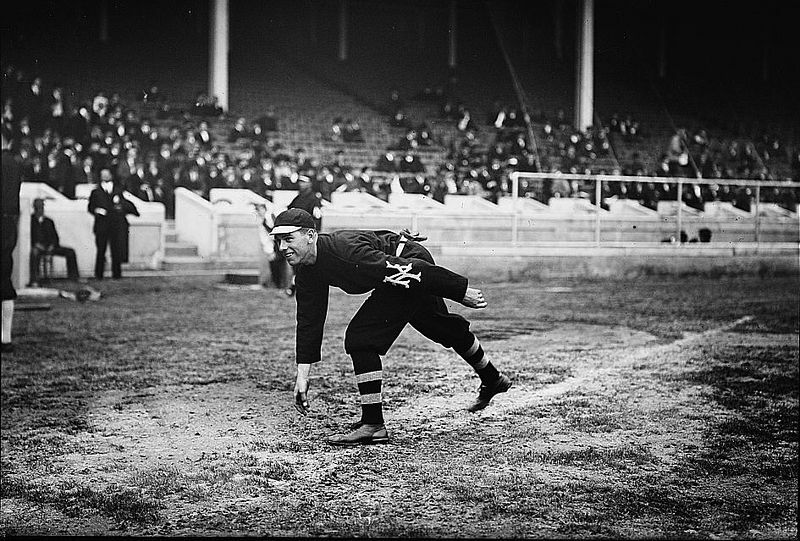 The Athletics took a 3-1, and that was all Eddie Plank would need. He gave up a mere two hits after the 3rd inning, with one of those being the one Snodgrass got thrown out on. The other pitcher, however, was taking plenty of grief. Marquard had pitched a gem, allowing only 4 hits in 7 innings, but he had made the mistake of giving Baker a fastball, and his coach was not pleased. “A good pitcher isn’t supposed to give up a home run like that,” barked McGraw after the game. 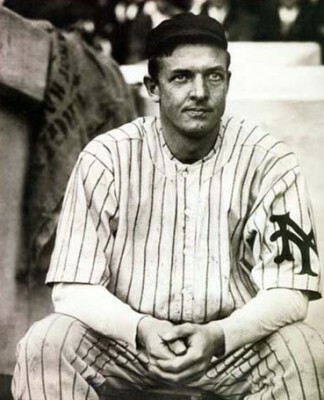 Mathewson ripped Marquard in today’s Times, as the headline of his column reads, “Marquard makes the wrong pitch”. 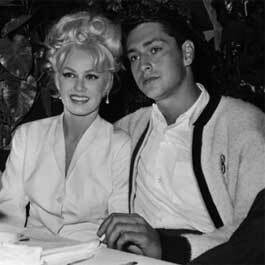 There is little doubt that the great Matty will make no such mistake against Baker at the Polo Grounds today. 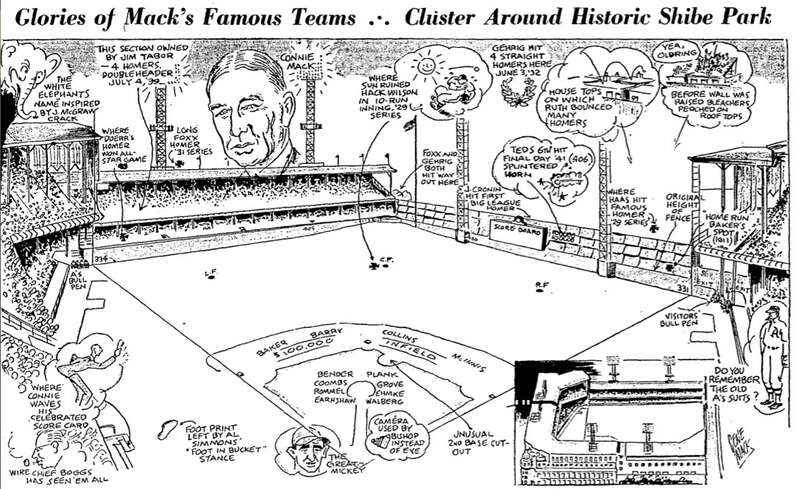 PREVIOUSLY: Mathewson leads Giants to victory in Game 1. 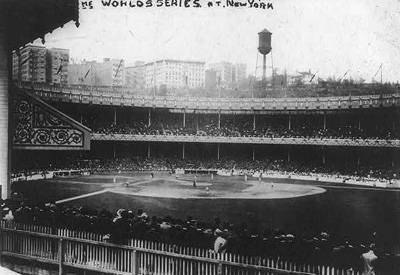 Welcome to Game 3 of the 1911 World Series! 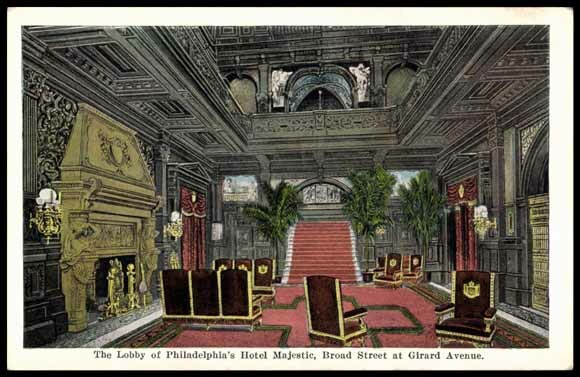 Hello, ladies and gentlemen, and welcome to today’s game between the AL Champion Philadelphia Athletics and the NL champion New York Giants. To watch today’s game in real time, just click here, look over your starting lineups, and then click “View Game” (Game takes about 10-15 minutes). We’ve got a packed house of 37,216 on hand to see the this pivotal game 3. (October 18th, 1911) NEW YORK– William Penn and Ben Franklin were seen milling around the visitors clubhouse late yesterday afternoon. They were there to extend an invite to one “Mr. 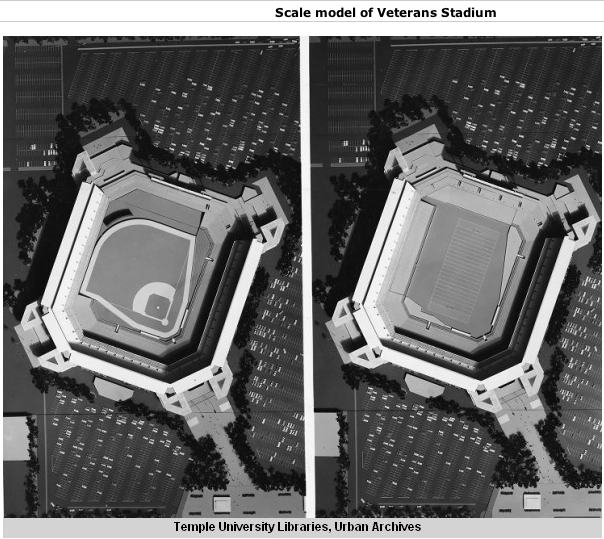 Frank Baker”, heretofore known as “Home Run”, to join that rare pantheon of Philadelphia immortals, men whose names and deeds shall be remembered in the city of Brotherly Love long after they are physically gone. It is funny what makes men heroes in this game. We are not cheering their intellect, stamina, or charm. We are cheering their ability to lift a piece of lumber off their shoulder and hit a spheroid in an act that takes places in tenths of a second. And the later in the contest they can do perform this rather random act, the louder we cheer. If there were any justice in this world, the real hero of yesterday’s ballgame would be the Athletics pitcher, Jack Coombs, who threw one of the greatest games in the brief history of this Fall Classic. 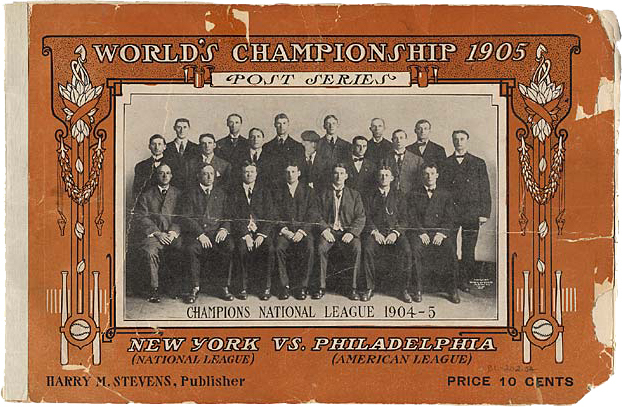 After all, in 11 innings, the great Coombs pitched every bit as well as he did a year ago (when he won three games against the Cubs in the 1910 Series), allowing a mere 3 hits to this vaunted Giants lineup. But perhaps part of the reason this game is so uniquely American is because we are a nation who loves instant gratification, and without a mythological past, we have to create our heroes on the fly. This combination of forces has created Philadelphia’s newest hero, now and forevermore. 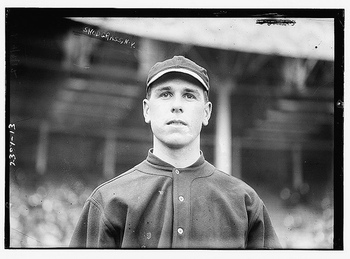 He is no longer Frank Baker, young third baseman of the Philadelphia Athletics. 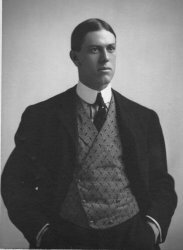 He is Home Run Baker, the American Zeus who hit the 9th inning home run off the greatest pitcher in baseball (sorry, Cy) to change the flow and the feel of the 1911 World Series. If the Athletics go on to win this Series, he will never pay for a steak in the town of Philadelphia again. After all, Game 3 seemed to be all but over. Sure the lead was only 1-0, but the Giants had found a way to thwart every A’s rally all afternoon. In fact, many Giants fans were headed for the exits, satisfied that their own hero was placing another feather in his cap. 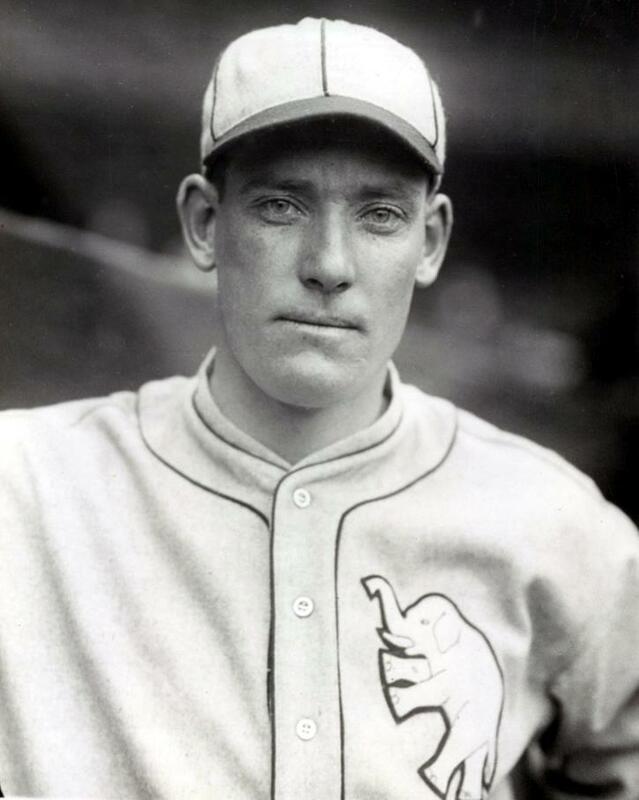 Through 8 innings, Matty had shut down the might Athletic lineup, and when Eddie Collins grounded out to Buck Herzog at 3rd to start the 9th, Giants fans began to discuss Game 4. The game was tied, and the momentum of the game and the Series was instantly changed. The Giants suddenly couldn’t handle routine grounders, and Matty lost the aura of invincibility he has worked so hard to create over the years. The game went into extras. a doctor. The New York fans turned on Snodgrass, booing and hissing as he walked back to the bench after the out, disgusted by his lack of sportsmanship. Furthermore, they cheered when Baker took his place again at third base. It was obvious at this point that New York had lost its cool. In the top of the 11th, the team fell to pieces. Collins singled to left, and Baker ran out an infield single. Giants third baseman Buck Herzog picked up the ball and threw it wildly and to first, and the A’s had men on 2nd and 3rd and no-one out. Danny Murphy hit a grounder to the shortstop Fletcher, but Art fumbled it. A run scored and all were safe. 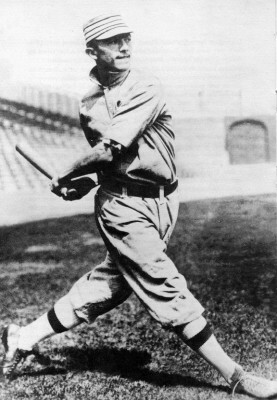 Harry Davis singled home a run and the A’s were up 3-1. The Giants made a last ditch effort in the bottom of the inning. Herzog tried to make up for his awful day in the field (he had 3 errors) by leading off with a double. 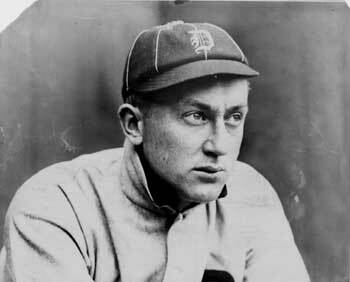 He got around to score on an Eddie Collins error. But with two outs, Beals Becker tried to reach 2nd on a steal, and Jack Lapp threw him out, the fifth baserunner Lapp threw out on this afternoon. A remarkable performance from a backup catcher against the fastest team in baseball. 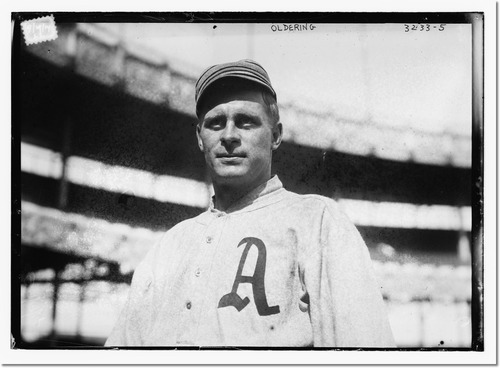 (October 20th, 1911) PHILADELPHIA– A’s center fielder Reuben “Rube” Oldring will be playing the rest of the World Series with a heavy heart. He lost his sister Lilianne to tuberculosis yesterday. He was wired the news today while he was preparing for Game 4 of the Series. He saw his sister after Game 1, as she lived in New York. It has been reported that the two were very close, and Oldring is heartbroken by the news. He headed to New York for the funeral as soon as the game was postponed, and hopes to make it back for Game 4, whenever it does take place. 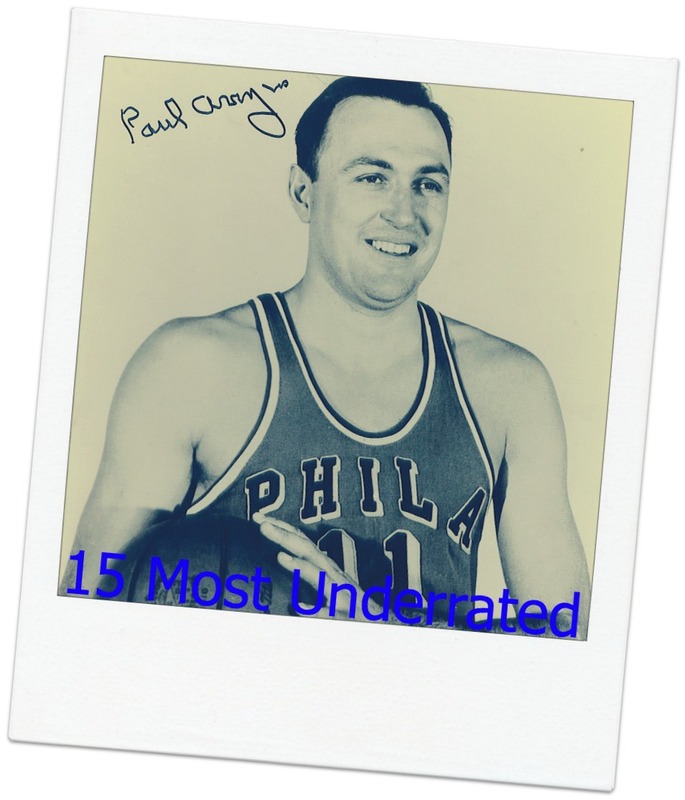 Oldring has gone 2-12 thus far in the Series.